Newtown’s newly rediscovered nineteenth century hero is being celebrated with a free hour long performance by inspirational story teller Peter Stevenson, and internationally renowned harpist Harriet Earis as part of this year’s Newtown Food Festival in the Oriel Davies Gallery in The Park at 3 p.m. on Sunday 3 September, to which all are warmly invited. This event marks the final performance of a Lottery funded project led by Newtown and Llanllwchaiarn Town Council (NLTC). In May this year the artists worked with three Newtown primary schools to celebrate the life of John Roberts, a famous Welsh Romany triple harpist and storyteller who lived two hundred years ago in Frolic Street Newtown. He lived there for most of his married life, raising a large family, and once even played the harp for Queen Victoria. Well known in other parts of the world, John Roberts is today almost unknown in Newtown. 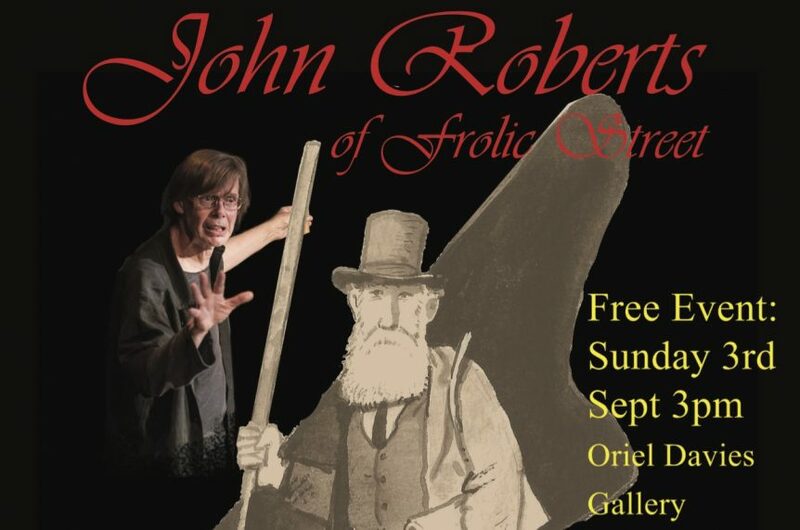 Featuring the traditional tunes he played and the stories of Esmeralda the Gypsy Dancing Girl, the King of Romany and the Green Man of No Man’s Land, the performance raises awareness of and tell the stories of John Roberts and his life with specially drawn illustrations and musical accompaniment played on the harp and his original triple-harp. A ten minute film has been made as part of the project and will be premiered at the Food Festival.